Lisa asked me for an approximate schedule of when things will be happening during the Business Meetings so that she can plan her shooting schedule as Official Videographer. I went through the planned agenda and tried to pin approximate times on things. The results are not pretty. 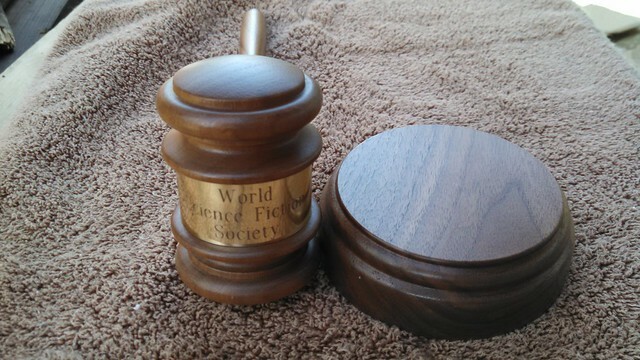 I expect the new Gavel of WSFS will get quite a workout next week. Thursday, the Preliminary Business Meeting, has the most crowded schedule, on account of having a lot of reports to receive, besides dealing with the agenda setup for the rest of the week. In addition, because it's the first meeting and I expect a lot of first-time attendees, I may have go slower than I might like, but probably faster than many of the people attending will appreciate. The meeting starts at 10 AM with the introductory video, and we need to adjourn by 12:45 to make room for the next panel. In retrospect, I would have been more comfortable with a 4 hour preliminary meeting this year. The Preliminary Meeting can't directly pass constitutional amendments, but it can kill them by Postpone Indefinitely, and it can amend them as well. Even the process of setting the debate time limits itself takes time. My rough projection is that we will start setting debate-time limits for the Business Passed On around 10:25. In all of the lists below, the numbers refer to the agenda listings. Once we've set times for the constitutional amendments awaiting ratification, we'll take the first "technical time out" to allow Lisa to change camera cartridges and for her staff to begin uploading the first segment. Note that this is not the order that they are listed in the agenda. The agenda list is the order in which we received them. We've arranged the consideration order the way that we think makes more sense, and in particular the two Hugo-nominating-related items (see below) are on the Sunday schedule. If the debate-time setting goes quickly on these items and there is no procedural wrangling or attempts to Postpone Indefinitely, we'll move on to the next two items. Otherwise, we'll take a ten-minute recess about this time. I expect I'll need it if nobody else does, particularly as we did manage to get a coffee/tea service for all four Business Meetings. I expect there to be attempts to Postpone Indefinitely on both of these, which means a four-minute debate on each of them. I continue to make the schedule on the assumption that no proposals get killed. If anything goes get killed, it reduces the downstream workload. The current plan is for these two items (and anything not resolved earlier) to be considered at the Sunday (Final Main) Business Meeting. However, we also plan to schedule a 30-minute Committee of the Whole on Friday for the "technical" discussion of the proposals; that is, the "how does it work" discussion rather than the "should we do it" discussion. If we didn't recess before considering these two items, we'll take the break after them. Next come the Committee Reports, probably around 11:50 or so. I'll turn the Chair over to jared_dashoff and go down to the floor to present the Mark Protection Committee Report, after which George Mitchell, who has hosted the WSFS and Worldcon.org web sites for many years, will address the meeting. If we haven't yet done so by this point, there will be another two-minute technical recess by now before entering the final segment of the day. The first two (*) are Hugo eligibility extension proposals and require a 2/3 vote. By my reckoning, we are likely to be so late into our scheduled time, and many of these proposals sufficiently contentious, that we won't have enough time to debate them at the Preliminary Business Meeting, although we can do so if time permits. If we're already pushing 12:20 or so by the time we get to this part of the agenda, I'm going to propose that we just set debate time limits on them and deal with considering them at the start of the Friday meeting. As you can see above, we have a lot of stuff to cover. I expect that at least some of the Resolutions will have to be considered at the beginning of the Friday (First Main) Business Meeting before we get to the ratification of Constitutional Amendments passed on.